The running time of Quicksort will depend on how balanced the partitions are. If you are unlucky enough to always select the greatest or smallest element as the pivot, then each partition will only separate one element at a time, so the running time will be similar to InsertionSort. However, Quicksort will usually pick a pivot that is mid-range, and it will partition the array into two parts. Let's assume Partition is lucky and it always picks the median element as the pivot. What will be the running time in such a case? Quicksort is a recursive method so we will need to use a technique to calculate the total running time of all the method calls. We can use a version of the "Recursion Tree Method" to estimate the running time for a given array of N elements. Each time Partition is called on a sub-array, each element in the sub-array needs to be compared with the pivot element. Since all the sub-arrays are passed to partition, there will be N total operations for each level of the tree. How many levels will it take for Quicksort to finish? Since we assume it always picks the middle element, the array will be split into 2 equal halves each time. So it will take log(N) splits until we reach single elements in the array. 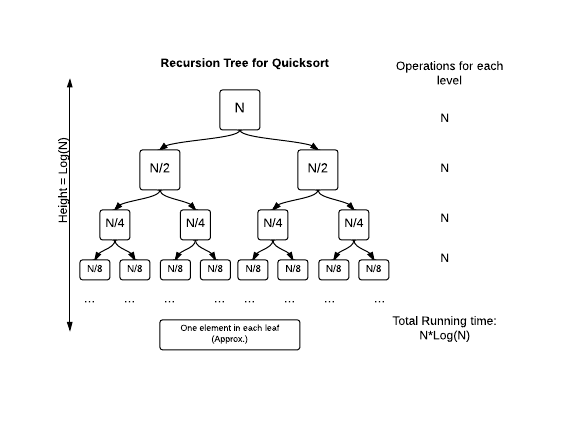 Since there are log(N) levels and each one involves N operations, the total running time for Quicksort will be N * log(N). In real sorting, Quicksort won't always pick the exact middle element. But as long as its not regularly picking really poorly, it will have a similar running time. To make sure it works well on most input, real-world Quicksort implementations don't pick the same index for pivot each time, but use some other technique instead, such as picking a random element. There are other techniques used to improve Quicksort. The Java Arrays class uses a modified version of Quicksort to sort primitives. Notice that n*log n is much much faster than the O(n2) running time of Insertion Sort. For example, on an array of 1 million elements, n2 = 1012, while n*log n is approx. 20 million, a much more manageable number. How much faster is Quicksort be than Insertion Sort in practice? Compare the running time of the two algorithms by counting how many swaps or shifts each one takes to sort an array, and output the difference. You can modify your previous sorting code to keep track of the swaps. Insertion Sort will take 9 "shifts" to sort the array. 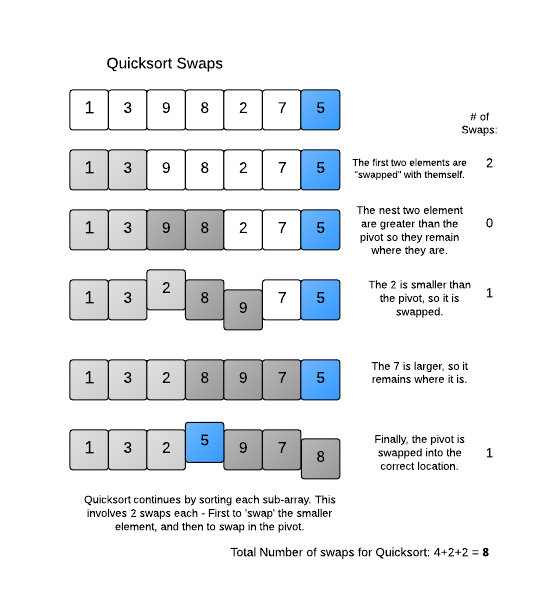 Quicksort will take 8 "swaps" to sort it, as shown in the diagram below. 9-8 = 1, the output. Compare the number of shifts Insertion Sort and Quicksort take, and output the difference.